Magento 2 is the latest version of Magento, one of the leading eCommerce platforms today. Widgets play an important role in Magento 2, especially from a functionality standpoint. In addition to offering more user-side functionality, Magento widgets help administrators add static or dynamic content to CMS pages and blocks. 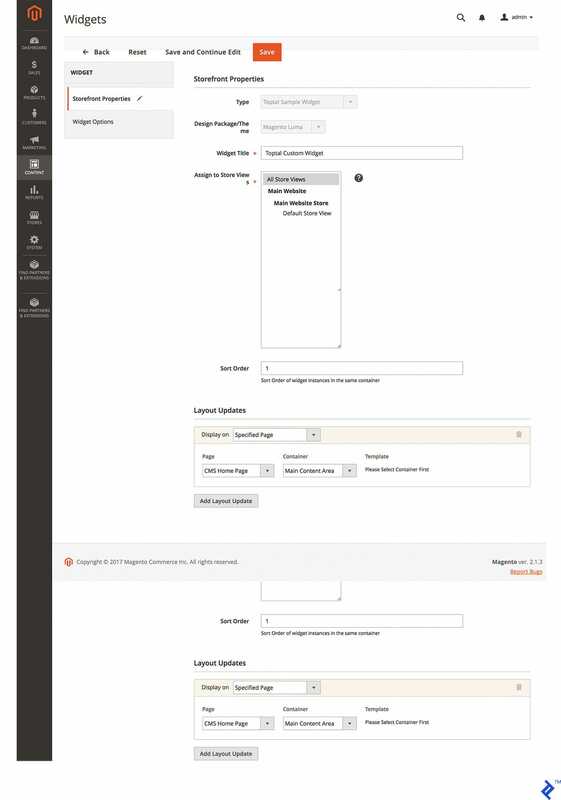 But, from a technical perspective…What’s a Magento widget? A Magento 2 widget is essentially a Magento extension designed with a set of advanced configuration options. Due to greater flexibility and control, they are used to provide information and marketing content via the Magento Administrator panel. One of the advantages of Magento 2 widgets is that you can “call” them from anywhere on the site. 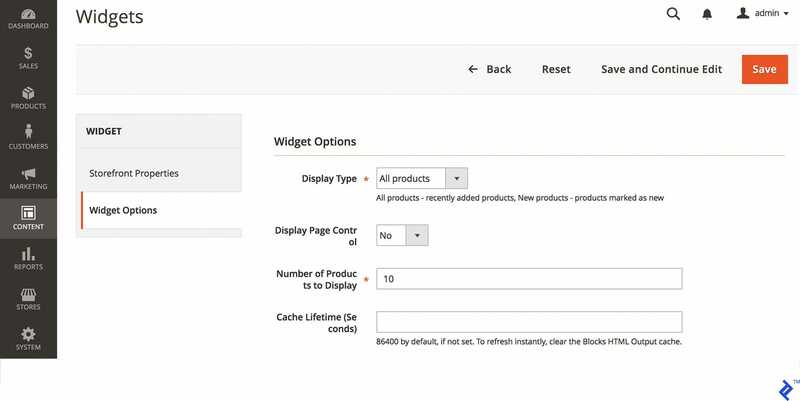 Widgets also allow administrators to add interactive interfaces and features in the Magento front-end, without having to code (actually, without even knowing how to code). Recently Compared Products — You must have observed this widget while browsing products on your favorite e-commerce sites. This widget is used to display recently viewed or compared products in the sidebar of a catalog page. They may also appear in your store depending on the theme. One of the crucial points is that the number of products which are listed in every single block can be configured. Orders and Returns — Whenever you shop for a product online, there is a must-have widget that provides quick access to orders and returns. If a user wants to review ordered or returned products, they can fill in the necessary details such as Order ID, Billing the Last Date, Find Order by, Email, etc. Catalog Products List — This is another widely used widget; everyone is familiar with the “featured product” sections on eCommerce sites, as almost every site has one. Featured products are usually placed on the home page for the purpose of product promotion. The particular product is shown with brief details like price, features, and options like add to cart, add to wishlist, and add to a comparison feature. Catalog Product Link — The main purpose of the Catalog Product Link widget is that it allows admins to manage links for products, including related products, cross sells, upsells, and grouped products. When you visit the catalog product link page, you will see different catalog categories initiated with an introduction. There, you’ll find catalog product links with various sub-links, such as catalog product link assign, catalog product link attributes, catalog product link removes, catalog product link types, and more. Catalog Category Link — In eCommerce websites, especially product-based ones, you will find no shortage of catalog category link widgets. Custom Block Widget — It’s possible to combine blocks, widgets and custom pages to display parts of the catalog or other information customers may find useful. Any website or web page needs a lot of functionality to run smoothly and to engage more visitors, and creating an engaging user experience is a must in eCommerce. That’s where custom Magento 2 widgets come into play, and that’s what they’re supposed to do. Widgets are smaller sets of code that we can add to the store. Using simple links to dynamic code, widgets can display all sorts of useful data tailored to help visitors and improve their experience. The ability to boost engagement using low-overhead, reusable widgets obviously means a lot, but sometimes it’s not just a matter of choosing and adding an off-the-shelf widget. 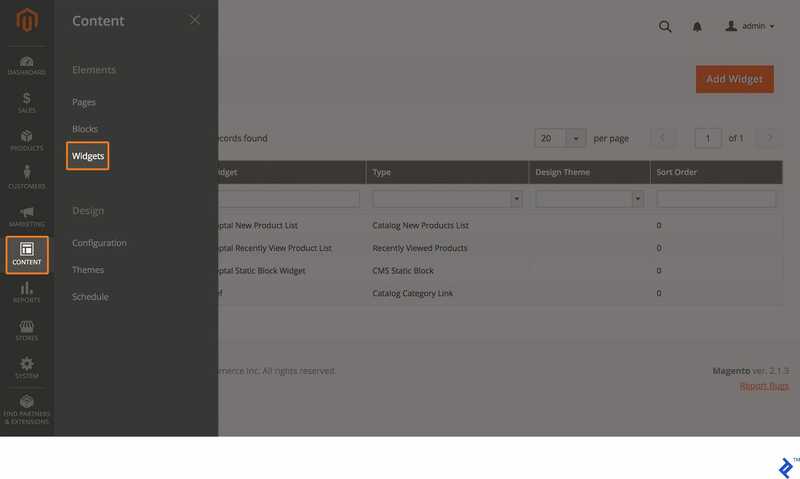 Using the Custom Widget functionality in Magento 2 allows us to create our own widget templates. A custom widget can sometimes offer an even better way of editing or adding quality content inside CMS blocks or pages. This simple widget allows us to add a new product list wherever required on the website, and there are various ways by which new products can be listed in Magento 2. Click on the Add Widget button. After that, we’ll be redirected to the Settings tab, where we have to select Type and Design options and themes. We can see the screenshot below, in which we have already selected the Catalog New Product List that we’ll be displaying at the front-end. We selected LUMA as the Design Theme option. After selecting both values, we have to move on the second step, where we have to fill storefront properties. Now we have to set the Widget Title and Storefront Properties, such as Widget Title and Store View. We are using Toptal New Product List and All Store Views. The most important part is the Layout Updates section, which will tell us where this widget is going to appear (e.g., home page, listing page, checkout page, etc.). It’s also possible to define an area in which the container will appear—for example, below header, above footer, footer, etc. Display On: Specified Page or All pages. Once we select the Specified Page option, we can proceed to set the properties, allowing us to display the widget on a particular page. Here we have the Page dropdown, which allows us to select CMS Home Page. Next, we need to select the container and template we are going to use to display the widget at a particular section. Finally, we move to the last tab, which includes widget options. Here, we can set the Condition, such as what type of products are going to be displayed, or include limits to the number of products and so on. If we select All Products, then the most recently added product will be displayed in this section. If we select New Products, then only those products that we marked as “New” will be displayed in this section. If we want to let our customers control navigation for multiple lists, we need to set the Display Page Control to “Yes.” If we have selected “Yes,” then it’s necessary to enter the number of products into the list. In Number of Products to Display, we can define how many products can be displayed in the New Products section. Also, we can change Cache Lifetime settings if necessary. Then we will be able to see the new products on the home page. Now, we’ll learn how to create custom widgets for Magento 2. Custom widgets offer the best way of adding and editing content inside CMS blocks or pages, because they can be tailored to match your requirements. Let’s start with the basics. We all know how to create a module, right? Just in case you’re not familiar with the creation of custom modules in Magento 2, we have a great tutorial that covers the process in-depth. Now, let’s move on to the step-by-step process of creating custom widgets in Magento 2. First, we need to create a new module which will requires namespace and module folders. For this example, we are going to use Toptal for namespace and CustomWidget for the module name. So, let’s start as usual with composer.json, registration.php, and etc/module.xml. This file will be loaded by Composer every time we run it, even though we are not actually using Composer with our module. Now we need to register our module with Magento, so we are required to create the register.php at the following location: app/code/Toptal/CustomWidget/registration.php. Now, we will create the last registration file, module.xml. After completing the registration step, next we create the widget.xml configuration file. In the above code, we get Title and Content as parameters to be displayed wherever the widget is called. The <widget> tag contains the block class Toptal\CustomWidget\Block\Widget\Samplewidget. This class is decelerated within Block/Widget/Samplewidget.php. The class instructs our widgets on which template to use. The next snippet of code shows how to define a block for the widget; we’ll set our template here. Let’s see how it looks. Toptal\CustomWidget\Block\Widge\Samplewidget is declared above code. In this file, we assign a custom template file inside the $_template variable. Next, we’ll see what contains our widget template. You can download this simple module here. It’s obviously not a full Magento 2 widget template, but it’s still a learning aid. In case you need more resources, or if you’re relatively new to Magento, official Magento 2 documentation is the obvious place to start. Finally, I’d like to mention a couple of personal dev blogs I found quite useful. Alan Storm has probably the most didactic content when it comes to learning Magento, and I think you should check out Alan Kent’s blog as well. The goal of this article was to provide a guide to widget creation in Magento 2, starting with a basic step-by-step tutorial covering Magento 2 widget development and custom widget creation. I am obviously a fan of the latter, as custom solutions tend to provide more flexibility and functionality. Magento widgets provide crucial front-end functionality, so it’s no stretch to say that clever custom widgets can help bring your next Magento project to the next level. The allow us to to implement even more functionality, add different types of items to the home page using different widgets, and ultimately, they simply provide developers with more creative freedom. But it’s not just a matter of improving user experience and conversions, or making an awesome looking design. All are obviously a priority for any client, but there are smaller, less obvious gains. For example, Magento widgets can save a lot of time and headaches on the admin side as well, and every client is looking to save man-hours as well. However, that’s beyond the scope of this article. My intent was to provide a quick technical overview, an easy to follow Magento 2 widget tutorial, not to discuss ROI and marketing. Very detailed and great article. Thank you for sharing it with community! Great work! Thanks for sharing this with us..Keep the good work! This post is very helped me to build custom widgets with magento. Great Article. Path to widget template not right. I've spent two hours and then one more to found out this mistake in tutorial... but other stuff clear and good explained. How to embed Magento widgets on other websites? Is there an extension module fort it? Thats need to done through custom module. Hello @kokimotorsport:disqus You can hire me at Toptal for any custom development regarding Magento. Hm, sorry, it seems my mistake. I see that path to widget template the same now. I was confused in path to template I think. No problam Thanks for confirming..
very detail article for custom widgets development. read this article and its useful. Vivek is a Magento certified developer with over 6 years of experience building and maintaining Magento 1.x/2.x community, professional, and enterprise editions. He always tries to understand the business needs of clients and always keep them in mind when creating reliable and well-designed Magento solutions.